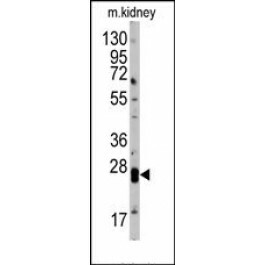 This antibody is generated from rabbits immunized with a KLH conjugated synthetic peptide selected from the Loop2 region of human CLDN1. CLDN1, a member of the claudin family, is an integral membrane protein and a component of tight junction strands. Tight junctions represent one mode of cell-to-cell adhesion in epithelial or endothelial cell sheets, forming continuous seals around cells and serving as a physical barrier to prevent solutes and water from passing freely through the paracellular space. These junctions are comprised of sets of continuous networking strands in the outwardly facing cytoplasmic leaflet, with complementary grooves in the inwardly facing extracytoplasmic leaflet. Loss of function mutations result in neonatal ichthyosis-sclerosing cholangitis syndrome.